I’m apologizing in advance for what will be a complete lack of posting for the next week or so… until I can figure out who the heck’s gonna supply me some internets at the new house. The Move was pretty much a success, with minimal bickering between Pete and I. I don’t even think we actually fought! Bonus. There’s still a few odds and ends that need to be moved and we have at least four hours of cleaning left to do, but as far as I’m concerned, we’re moved. 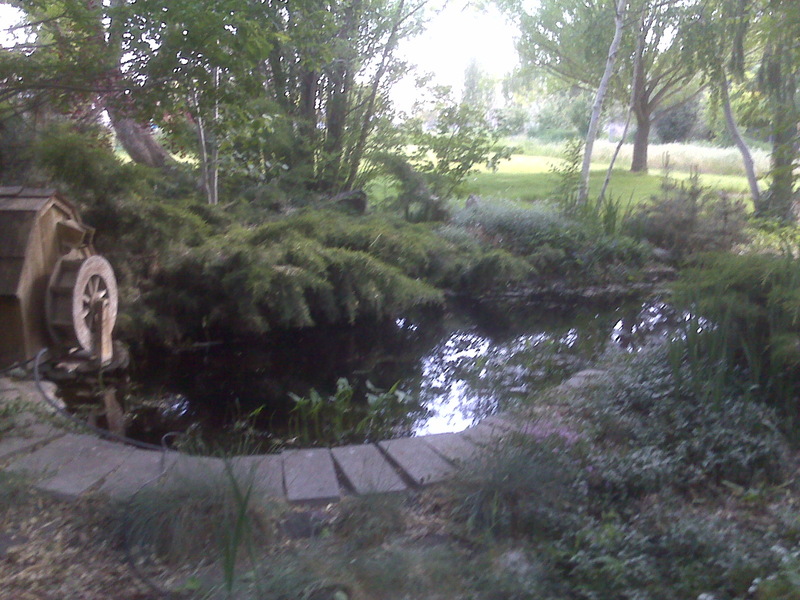 I haven’t gotten the opportunity to take pictures like I want to, but here’s one I took with my phone of our pond. And before you ask, yes, we have fish in it. Not many – maybe 10 goldfish, a couple “mosquito” (I can’t remember their real names, but they’re not the real mosquito fish) fish and two black moors (I think that’s what they’re called anyway – I just know they’re cute). We’ll be getting more because I haven’t seen a fish in there since we put ’em in the water. Pete says they’re there and that he’s seen ’em… but I couldn’t tell you from personal experience. So, I’ll be taking pictures and posting them when I can so you all can live happily and vicariously through me and my wonderful new home. Yes, jealous here also. And with fishies!!! Umm, awesome! I cannot believe that you have a POND!